Big N and I took a trip to our cellar to drop off some wine and pick out a couple that have come of age. Last night we invited friends H & M over for a wine pairing dinner featuring two of our favorites: Pinot Noir and late-harvest Trockenbeerenauslese (this one was of the Ortega grape varietal, a Müller-Thurgau hybrid similar to Reisling), or TBA for those in the know. We started off the evening with Penner-Ash 2006 Willamette Valley Pinot, paired with two sheeps milk cheeses, Dante- a hard cheese, and Guilloteau Berger de Rocastin- think brie but with more barnyard qualities. The pairing was beautiful. The Pinot was spicy, earthy, with plenty of terroir typical for the dark volcanic soil of the Willamette Valley, more old world style. The spiciness was complemented perfectly by the creaminess of the Guilloteau. 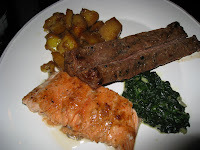 For dinner we did a surf and turf: ginger sake glazed grilled salmon, ginger garlic and soy marinated flank steak, sweet potatoes with clove, cinnamon and maple syrup glaze, and sauteed spinach garnish. We paired that with a Pinot from one of our favorite Central Coast producers: Cottonwood Canyon 2001 Elizabeth's Vista Pinor Noir from the Santa Maria Valley. This pinot had some age to it, so it was a beautiful crystal clear garnet color, with strawberries and cream, soft leather and scented tobacco notes and a touch of gaminess, and dark fruits on the lingering finish. Not as spicy or earthy as the Penner-Ash, but the ginger and clove in the meal complemented the wine well. For dessert I cooked a recipe from The Wine Lovers Dessert Cookbook. 'Tis the season for Quince! 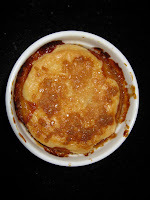 I made individual Quince Pot Pies, spiced up with cloves and cinnamon, and added a little TBA to the mix because cooking with wine never hurt anybody. We paired it with the TBA of course, Villa Palatina 2005 Ortega Trockenbeerenauslese from the Pfalz region. This wine was a beauty- it can be aged 40 years! Amber golden color, peachy notes with stone fruit and molasses on the palate. The wine is so viscous it reminds me of maple syrup. The apple/peachy quality of the quince and the buttery flaky topping brought out the creaminess and tempered sweetness of the wine. My tummy was satisfied and my palate was quenched. Not a bad way to spend a mellow Saturday with friends.